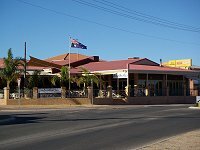 Dongara is located 80 km north of Eneabba (360 km north of Perth) and it is a very popular holiday destination. 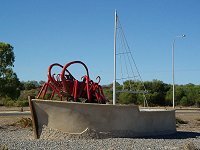 The stop in Dongara - Port Denison is a must for travellers on the Brand Highway - for a cup of coffee and/or a dip in the ocean. 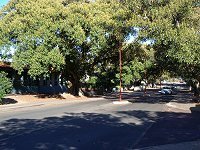 Main street of Dongara, Moreton Terrace, is lined with giant Moreton Bay Fig Trees that were planted in 1906 by the Irwin Road Board at a cost of 12 shillings and 4 pence ($1.63). 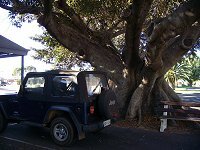 The trees are National Trust classified and form a shady canopy over the Terrace. Old mill still stands on the Brand Highway and, despite the fact that it is not operational for a long time now, is still attracting several dozen pigeons. For more information please visit Irwin Shire Internet page. Please click on the image to enlarge it.